Wigmore Street/Welbeck Street junction, just behind Debenhams. Not sure of HGV type but quite a bit of renovations going on at top of Marylebone Lane junction. Sight lines for pedestrians in places are not great. Can see the road is closed from outside my office window with rumours circulating the office. The traffic lights around here often do not have a pedestrian phase, it's like running a gauntlet most days. I was witness to this, had to speak to police, stop people taking pictures/cycling over her body and then speaking to the drivers using Google Translate (two tipper trucks, one involved, the other following - both drivers only spoke Romanian, which had no bearing on the incident as far as I could see). It was a horrific scene and not something I'm likely to un-see any time soon. Still processing. Horrible. Hope you're OK, Aaron. If in any doubt, speak to Roadpeace, as they also do witness support. Deeply distressing. Cycling over her body? What are people like? Had they just not realised what was going on? I'm OK, or at least I'm lucky in that mrs_com is as close to a PTSD psychotherapist as you can get. To be fair to them, there was another tipper truck stopped behind the scene so they couldn't see until they passed the truck. If they undertook it they came out right by her body. The photo takers were the bigger ghouls. I can understand the curiosity but as soon as you realisr the gravity of the situation (it was very obvious someone had lost their life), show some decency. I saw both trucks there, I just assumed the second hit her, saw how far along the first one was, I dread to think about it now! That's what the ambulance and police assumed, took a while to convince them otherwise. Geez, y'all know where we all are if you need us! So, so sad. RIP Herta. Her name sounds as if she may have been a German refugee once upon a time. I had no idea of her age (at the risk of being too graphic, there was no way to tell), for some reason that she was 96 is a shock to me. She was smartly dressed with sunglasses and small heels. I still haven't been contacted for a follow up statement (or to confirm the one I gave on the scene) so rang the number on the Standard page. They just said to wait. I'll ring again next week. Saying she was pronounced dead minutes later was only because of the amount of time it took for the ambulance crew to respond (heavy traffic) but it was all very quick. There was no suffering, if that is any consolation to anyone. Still not sure how this is affecting me/has affected me. I did not cycle last Thursday or Friday so only got back on the bike on Tuesday. I probably feel more fragile/vulnerable than before but to be honest, I don't feel my level of immediate risk has gone up. It has re-affirmed what I though about how to respect larger vehicles on the roads and not take my security for granted. The barriers outside that posh pharmacy were removed the following day. Not sure if they had been left up too long but they gave a choice of either walking between the buildings and the barrier or along the kerb stone. It was lunchtime foot traffic so the pavements were busy. Thankfully for me my office is in the white building visible above the forward of the two trucks in the photo so I stuck to the building side. Sadly for her I assume she was heading to cross at those lights, the traffic had stopped at a red so she went down the road side. There really was no pavement to speak of, the barriers were sitting on the kerbstone. The lights changed, the truck moved off and she was left with nowhere to go. As I've been walking around the area I've been probably irrationality angry at the risk people take to save a few seconds. In a "do you not realise what happened" kind of way. But how could they? Seeing her photo also makes a lot more sense. All I know was the colour of her hair which was the same. I'm really sorry you had to see that. I thought she might have been. Austrian and not German, as it turned out. These refugee stories are always filled with the most abject horror you can imagine. The jc carries the story, using text identical to that in the Standard. surprised that I can't find any news stories about the pedestrian run over by a bus at the top of Brixton Hill on Saturday night - happened about 8.40pm. My friend was in the sainsburys local, heard the thud, looked up to see body under the wheels, and was one of many who rang 999. We went past about 90 mins later and the road was closed off both ways, pedestrian taken to hospital, described as "life-changing" injuries. His shoes were still in the road - grim. It's bad, but the many pedestrian injuries and deaths usually get far less coverage than cycling crashes. It's always a problem with the news that if something happens all the time, it is considered less newsworthy. I think coverage of pedestrian crashes has improved in the last few years, but there's still a long way to go. bloody hell. definitely different, the one i saw was a saturday evening. oof. ^^^^^ fascinating. A reminder that mobile cranes, cement mixing lorries and several other types of 'machinery' are still exempt from having to have MOT checks or with complying with the usual weight and driving regulations which apply to other lorries. I think the corporate manslaughter conviction of Balwins is the first such conviction linked to a road death. As well as having to pay £900,000 in fines and costs they have had to publish a response on their website. It seems that they did not do enough to comply with the first 'improvement notice' from HSE and had to demonstrate a higher level of maintenance and safety. 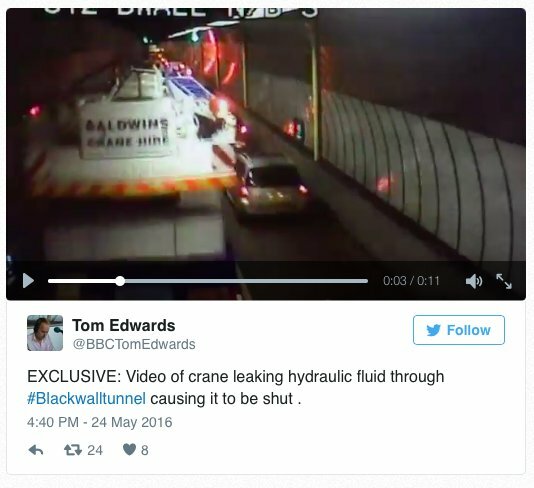 A few decades ago I was driving behind a crane in Blackwall tunnel. There was a crash and sparks as bits of its differential and driveshaft fell off, cutting several hydraulic pipes and spilling all the oil all over the road. The tunnel was only closed for about 8 hours while they cleaned it up and removed the car that run into the debris. I cannot remember if it was a Baldwins crane.